Before moving to Thailand, I considered myself a curry lover, and still do. I grew up eating Panang curry at home and love every variation of this Indian delicacy. Back home I head to Mt. Everest in Evanston with my family to indulge in Indian food. Even though I smell like an Indian restaurant for days it is worth it every time. It is undeniable that Kaeng khiao wan (literally translated to sweet green curry) is a staple at every Thai restaurant and green curry paste is as prevalent in the market as fresh coconuts. The first time I tried green curry I was surprised by the sweetness of the sauce. Something was not right. How could I not like a dish made with Keffir lime leaves, coconut milk and Thai basil? The only conclusion I made is that I am not a fan of Thai eggplant and pea aubergine (I will admit, I was not familiar with this vegetable the first time I tried it). Both vegetables are slightly bitter and when cooked keep their coarse, crunchy texture. I guess I am used to eggplant that melts in your mouth. Even though I don’t love green curry, the entire country of Thailand swears by it. So, if you have a fantastic recipe for green curry, send it my way, I will always give something another try. Or better yet, next time you’re out for Thai, order the green curry and make your own conclusions about this famous Thai dish! But I LOVE green curry!!! I like curry. It’s the folks around me that don’t like when I eat it! Not sure why. A good buddy of mine has started up working at one of the newest – trendiest – Thai restaurants in NYC now, Kin Shop. He’s taken some of his knowledge back with him to my house on occasion to cook, and as of now the massaman with the braised goats neck is my fave. Red curry is right in there, running a tight race and rounding up the second place position. totally agree! I always get the yellow! 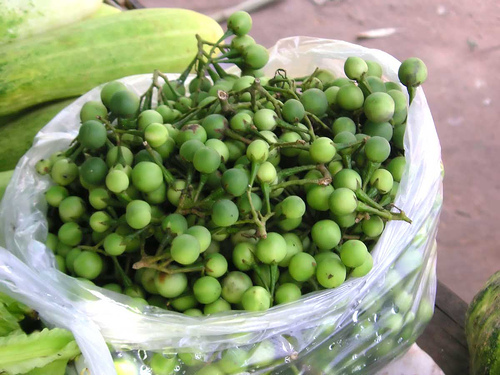 are you sure, the greenish eggplant in the pic above is available in thailand?? I thought it is available only in India. Not just India or my state ‘Karnataka’ but supposedly available only in the coastal region of Karnataka which is Mangalore, Udupi and North Canara. It is available in Asia! From Philippines to India that eggplant is so everywhere. Never been a fan of green curry either- I find it too “bitter and hot” (I might be a wuss, or indeed never had a proper curry) but when given a choice 9and yes, that usually happens- never been forced to eat curry….yet…lol) I have always opted for the red one- I find it sweeter and smoother. 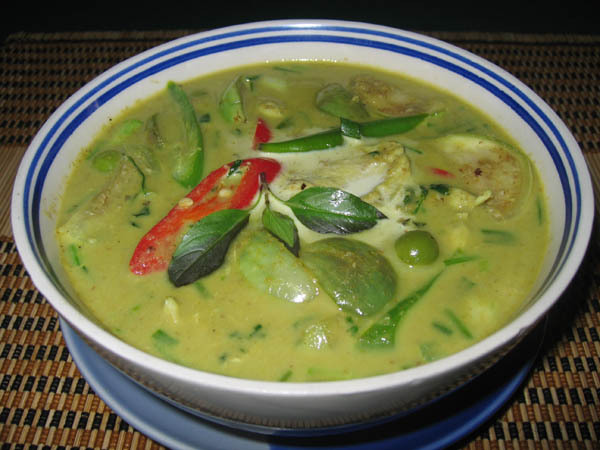 However- the pics on your blog make green curry look so tempting… I might give it anotehr try! I haven’t tried curry, but I know that many of my friends love that stuff. Thanks for sharing. I just tried green curry for the first time last night, here in New York. After years of my love for red curry, green curry just tasted gross in comparison. I’m going to Bangkok in a few weeks and was hoping it was just the american version of it that I dislike but after reading this, I realize it may not be so. Thanks for the Thai writing of it so that I know what to avoid. Your blog is awesome!I just read the whole thing, and am SO excited to go now! Its awesome that you get to teach there. How’d you get into that? Is there any places that I must visit while I’m there?? I’m trying to steer clear of the tourist trail but I don’t even know where the tourist traps are. I love the pictures….I wish I would like these things, but I don’t have the taste for that yet. 🙂 Great Post! I LOVE GREEN CURRY, but I agree with you that there are much tastier things out there. Do you think that you’ll learn to love it if you keep trying it… or will hit a ceiling and just go insane from eating something you know you can’t stand? By the way, congrats on being Freshly pressed. ‘How could I not like something made with Keffir lime leaves, coconut milk and Thai basil?” Yes, I agree, those are wonderful flavors. It had to be something else! Your photos are beautiful, and I like your easy to read theme. I LOVE green curry! I’ve been to Thailand, and have a great source here in Los Angeles for all things related to Thai cooking, the “Bangkok Market” on Melrose Ave., I’ll do a green curry and get back to you…Nice blog! I am a curry lover as well! I do not have any green curry recipe to share, but I must say that there is something about green curry which makes me want to go for more, not exactly in the sense that it is omg-godly-delicious, but perhaps because it tastes very unusual compared to the other curries around. My mother will be serving green curry this Chinese New Year, can’t wait! Don’t know if you’re celebrating it, but Happy Chinese New Year to you! The pictures are so yummy-looking. Great insight into the curtual eating of another world. I’m from Indonesia and I’m not to fond of green curry either. So you’re not the only one. But if I come accorss good green curry recipe I’ll share them with you. Curry is an amazing spice. Absolutely love it! Thanks for sharing this info. I love Thai curry. I think it is somewhat lighter than curries from other nations. Try the chicken curry from the Philippines, lighter than that of Thai, and it has a sweet taste due to the pineapple. I’m with you on this one, Alexa. Something’s weird about green curry, and no matter how many times I try it, there’s still something odd! I lived in Thailand for 6 years, and never developed much of a taste for it either! I love green curry. However, finding a fish sauce free version is next to impossible. yup, green curry is nice.. but not my fav… too fatty..
At this very moment, I have 2 open containers of green curry paste in fridge. In a home over 1,000 kms. away. Ah, green curry! Yummers. 🙂 Glad you highlighted it. Green curry doesn’t have to be fatty. It depends on the company brand paste that one buys. And I don’t use coconut oil…nor any coconut cream..which is fatty/oily to me. I think green curry straight from Thailand is pretty much heaven… mmmm. I love red curry. I made red curry sauce over chicken. It is my favorite food. Thanks for the blog. I love it. I’m posting your blog on my facebook page, if you don’t mind. Thanks for the recipe! 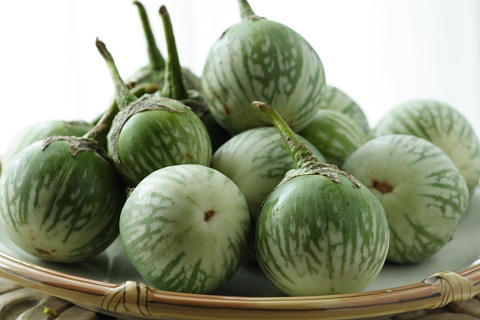 Looks amazing… where can I find tomatillos in Thailand? Love your blog also… I will definitely be using the store when I get back to the states. I bought some green curry by mistake to use in a recipe that called for “curry paste” (wrong curry….) I will have to try it now, thanks for the inspiration! gheng kiao wan mai chop na? There used to be a vendor in Chiang Mai who sold Green Curry hamburgers. They were really something. I think he was just mixing the paste into the ground beef before cooking. Worth a taste if you haven’t tried it. I have been living in Thailand for 2 months and am still trying to decide on my favorite thai dish! I am not a huge fan of green curry either. I really like their sweet and sour dishes! I’ve never tried green curry! In fact, until I read your post, I didn’t even know it existed! Indian curry is and has always been my favorite. They’ve got so many different variations to this curry, and so many different varieties! And, I’m always a fan of anything with a little bit of spice in it, it tastes great! That’s what those pea-like things are! I couldn’t figure out what those were there when I was there. Those and rose apples. great, listen I am trying to put togather 365 dishes using brinjal/eggplant/ how about helping me out? i”ll create a link specially for it. Still putting together eggplant recipes? I’ve got an incredible veggie lasagna recipe that stars egggplant. Let me know if you want me to send it to you! Excellent photo of a soup. Thanks and… how is green curry? Yellow curry for me anytime 🙂 Never liked the green one. Well, it is always good to try something new. Is it not? Enjoy your travels (and your eating)! There is something very unappealing about crunchy or eggplant. I like it cooked to death…like a soup! We have those too in Indonesia. But in my opinion, that green round eggplant is better to be eat with hot chili (we call it sambal). Never tried the curry, though, but I like your posting. Thanks for sharing, and congrats for being in freshly pressed. I’m absolutely with you – I wanted to like it, but despite my many attempts since arriving in Thailand I don’t like the eggplants either! I love this post! I couldn’t agree more with everything about it. Loved Thailand and loved the food but green curry makes me upset. Everything that could be right mixed in together in such the wrong way. Anyhow, glad to have stumbled upon this.